Stay-at-home dads face a lot of challenges after their wife goes back to work. But Christopher Allen is dealing with them creatively. After his fiancé, Jennifer Capo, had to return to work after the birth of their daughter, Destiny, he had to find a way to feed their little girl, who’s become used to breastfeeding. He initially shared the video through his Facebook page but it quickly went viral after Kristy Kemp, the founder of Breastfeeding Mama Talk posted the video to her page. It first got a thousand views on his page but after Kemp shared it on her page it has been viewed over five million times (as of this writing). 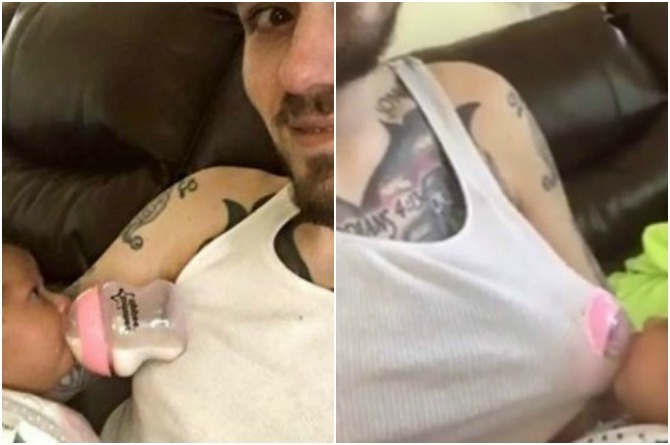 “Mommy had to go back to work so daddy’s helping out…” he says in the beginning of the selfie video and we see a small bottle of milk protruding from his shirt. Though it has received some negative comments, majority of the feedback from other parents have been positive and encouraging. Find out more about this innovative dad on the next page. The observant dad shared how observing his infant daughter’s behavior led him to his brilliant discovery. He shared that he is continuing to feed Destiny, who is now eight weeks old, in this manner. So, has this new experience has given him a newfound appreciation of what his fiancé goes through as a breastfeeding mom? Did you know that sleeping early is healthier for your child?